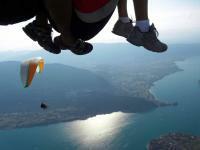 Discover an original view over the Annecy Lake thanks to paragliding. After a soft take-off you will over-fly this wonderful turquoise lake of Haute- Savoie, comfortably sat. The instructor sitting behind you will give you explanations on this exceptional mountain scenary. We ensure you this two-seater flight will leave you speechless ! Our quietest flight, reserved to child under 12. Enjoy the pleasure of an unforgettable tandem paragliding flight with an amazing view over Lake Annecy An exceptional adrenaline rush over the lake and the surrounding mountains for a magical moment! Our quietest flight, reserved to people from 12 years old. Enjoy the pleasure of an unforgettable tandem paragliding flight with an amazing view over Lake Annecy An exceptional adrenaline rush over the lake and the surrounding mountains for a magical moment! 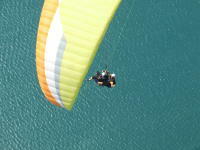 Enjoy the pleasure of an unforgettable tandem paragliding flight with an amazing view over Lake Annecy. 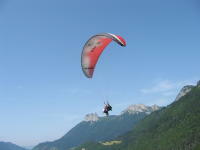 An exceptional adrenaline rush over the lake and the surrounding mountains for a magical moment !